Looks like another winner...Thank for all your searching and reports. Cheesesteak from NY Chicken & Biscuits in Hartford. Curious about the name of this place. Do they do chicken and biscuits like one would find in NY State? 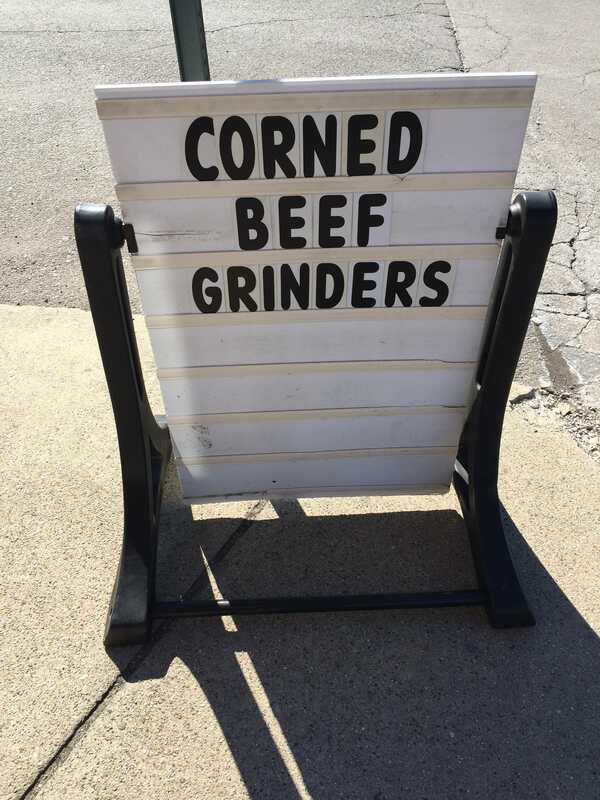 Years ago when I lived in Connecticut I would stop at H&M grinders in Windsor Locks for the best grinders. I 'm in Florida and don't have a chance to get up there only ounce or twice in the last ten years. I knew they were slowly building a new store next door. Are the grinders still as good as they use to be. The Italian combo that I had there a few years ago impressed me - but then, that was still pretty early in my explorations. I remember thinking that the meats were of good quality. The bread, as you can see, was the same unremarkable loaf that you often find around here. I don't know if that's what they were using in your days. This remains the only H&M grinder that I've had so far. I ought to get back up there and try another. This is still one of the best threads on Roadfood. Keep it up Ketteract! 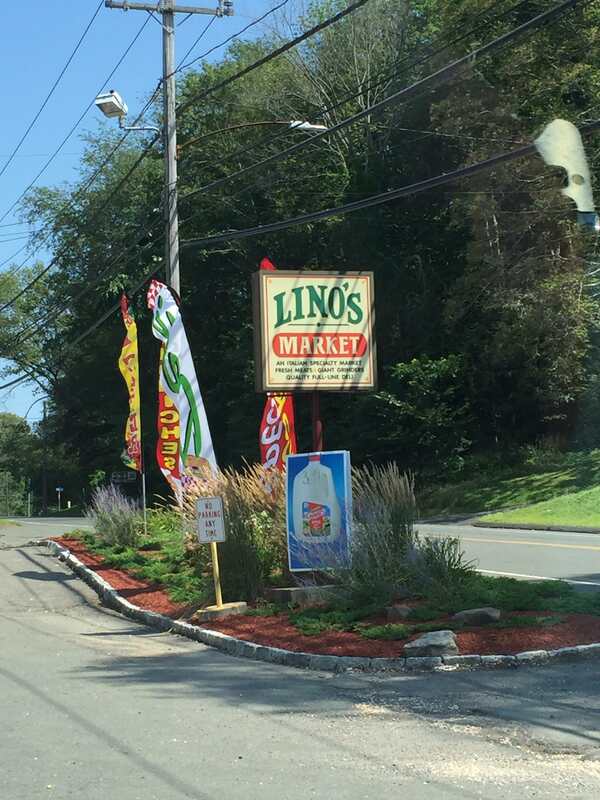 While in the Middletown area today, I took the opportunity to stop by a little Italian grocer that I'd noticed some months ago and bookmarked: Lino's Market, in Durham. Giant TV screens aside, I like to think this bears some resemblance to the small stores that used to be the standard places to obtain grinders - before the rise of dedicated grinder shops - but what do I know? They had an "Italian combo" on the menu, but the name only dictated the bread, meat, and cheese - I had to specify all the veggies and toppings myself. Good. That's how I like to do it. 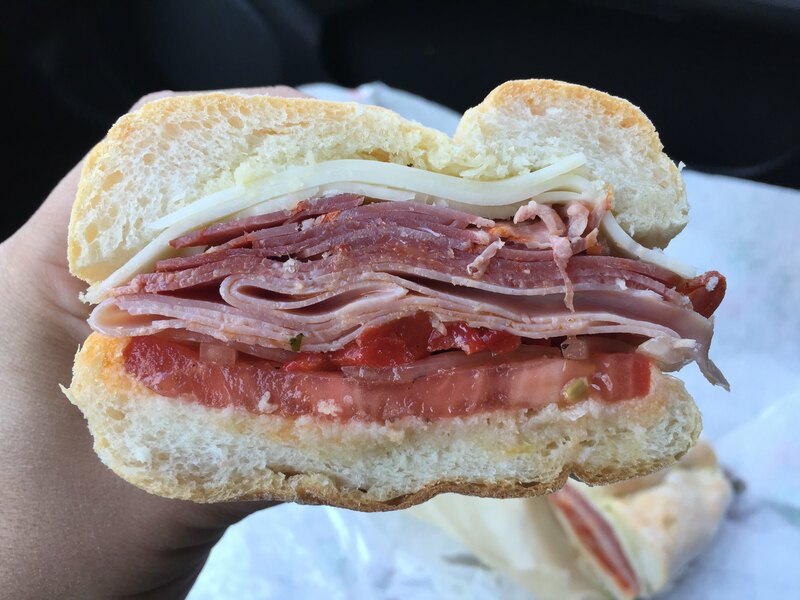 Ham, salami, capicola, provolone, roasted peppers, tomato, onion, oil, and vinegar. Undoubtedly, you're already noticing that bread. Marvelously crusty on the outside, chewy on the inside. Among the best bread I've seen used on a grinder. Well-assembled (although I would have put the tomato on top), and elevated considerably by that bread. I'd rank this one alongside Hall's Market's: not a mind-blowing experience, but an excellent example all the same. 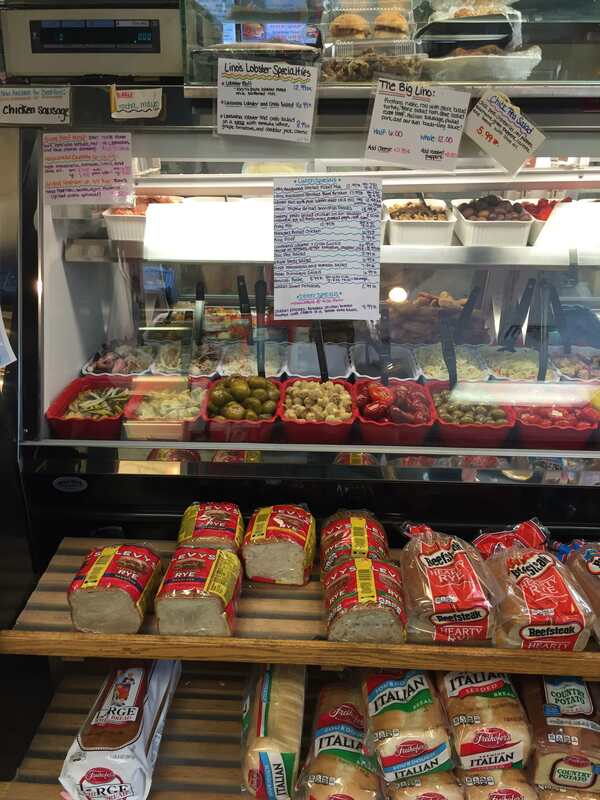 Another sandwich that I'll mention is what I recently had from the Pol-Smak Polish Deli in Terryville, a tiny store with one counter, a couple of aisles, and a sandwich menu that listed only turkey and ham. 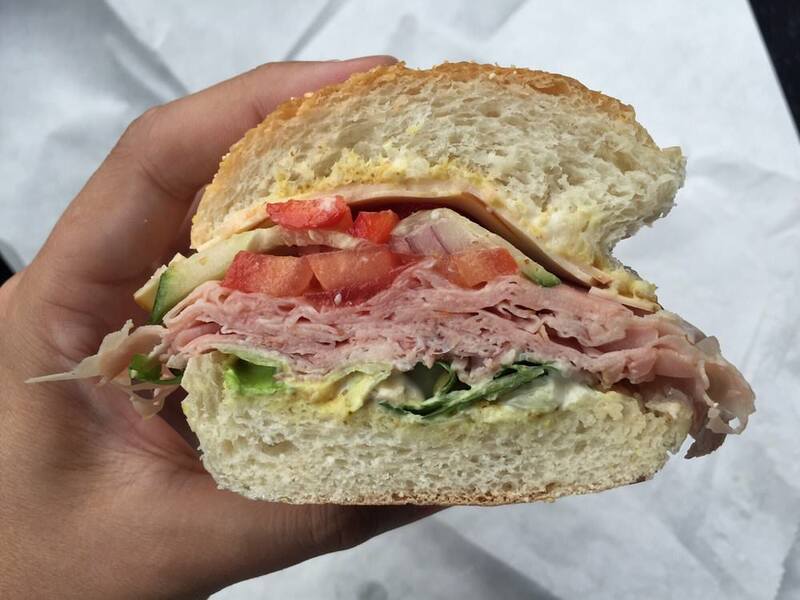 I could get my sandwich on a Portuguese roll or a grinder roll. I hadn't felt like completely stuffing myself, so a Portuguese roll it was. Check out that thinly-sliced ham. The lone woman behind the counter knew exactly what she was doing. The veggies were a refreshing mix of cucumbers, red onion, and tomato, and the cheese was Gouda. You could choose from any cheese in the deli case; perhaps this extended to the meats as well, but I figured I would stick to what was written on the menu for the time being. A very competently done sandwich, and an absolute steal at $4.99. Oh! One more, from Cavallo's in Waterbury. Not a grinder per se, but you can get it as a grinder, so I'm including it. 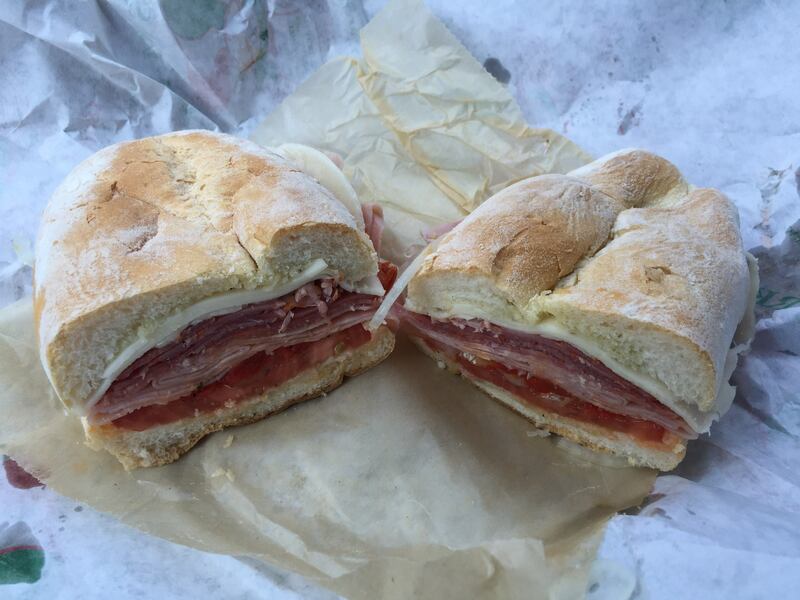 They call this "The Godmother", and it definitely earns that lofty title. 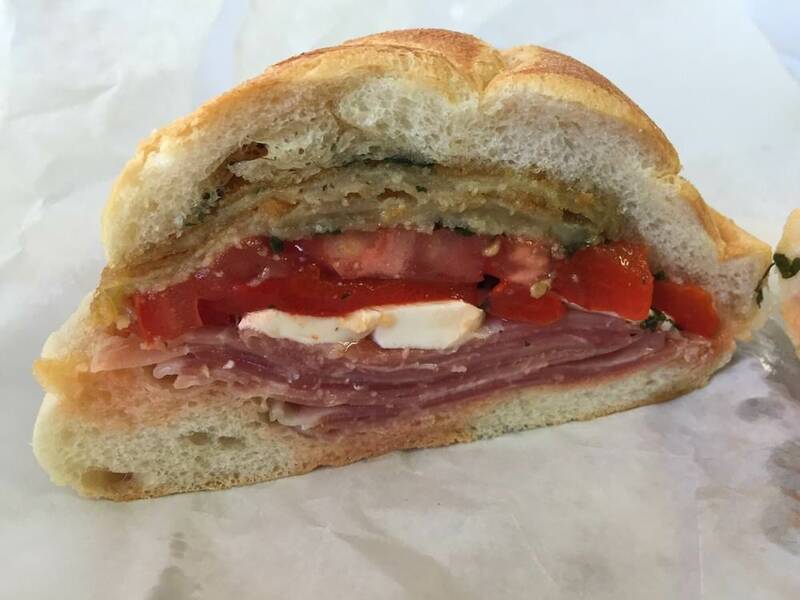 Fried eggplant, prosciutto, fresh mozzarella, basil, roasted peppers, tomato, and olive oil. Worth going a little out of your way for! I was on the fence as to whether the prosciutto was necessary, since the eggplant boasted its own wonderful robust flavor. In the end, I decided the two worked very well together. Beautiful. And you're right about the markets being the places you'd go to for subs. 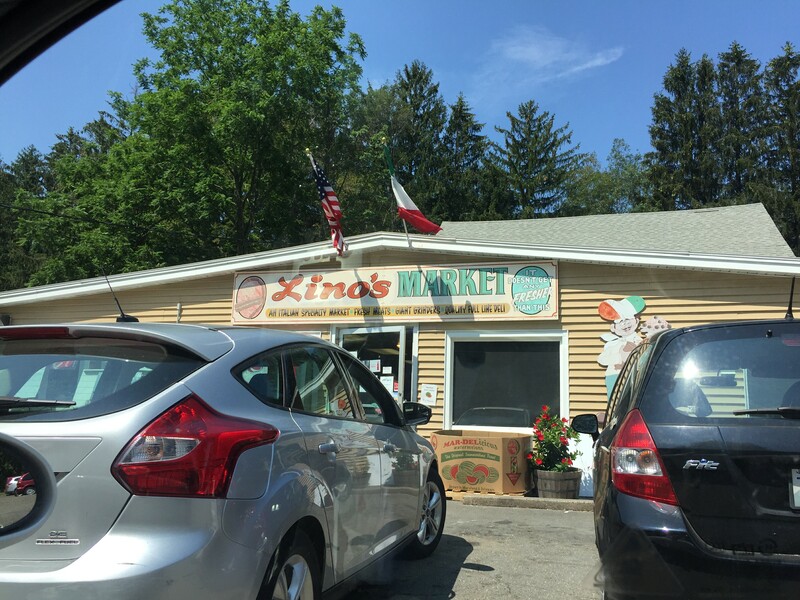 Small grocery stores in the neighborhoods. I never heard of a sub shop. 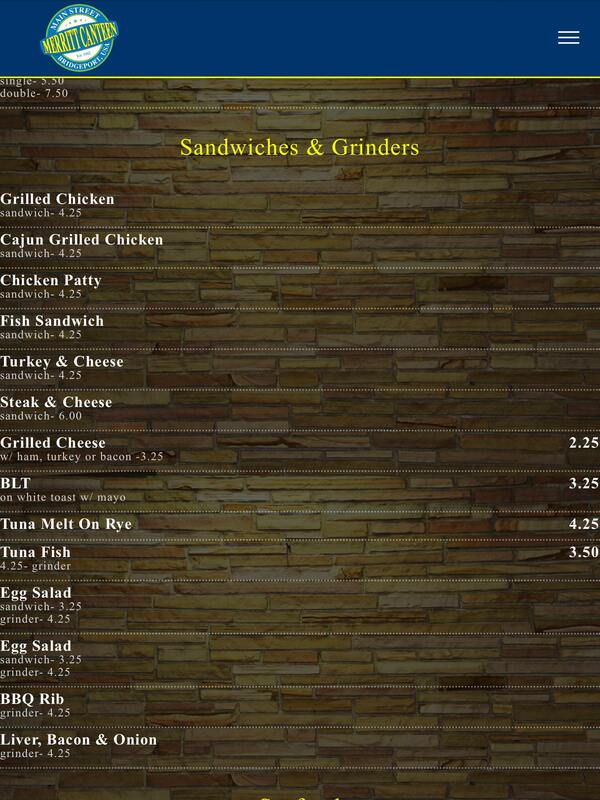 I also never heard of a grinder, except in Bridgeport. I would not turn down any of those sandwiches. They all look great, especially the one on the Portuguese roll. 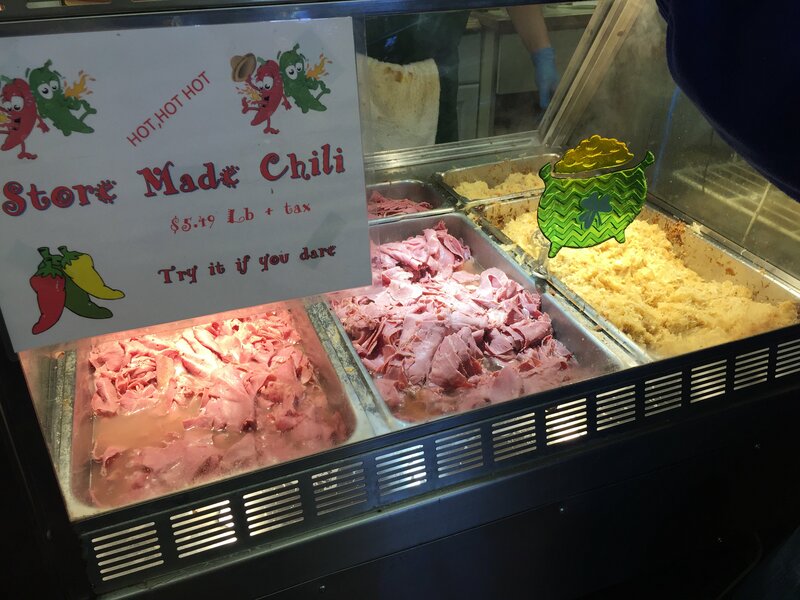 I've noticed that in many of the cities and towns I visit or pass through, there appears to be a sandwich shop that does this. I think it might be called "Subway"...perhaps you've heard of it? 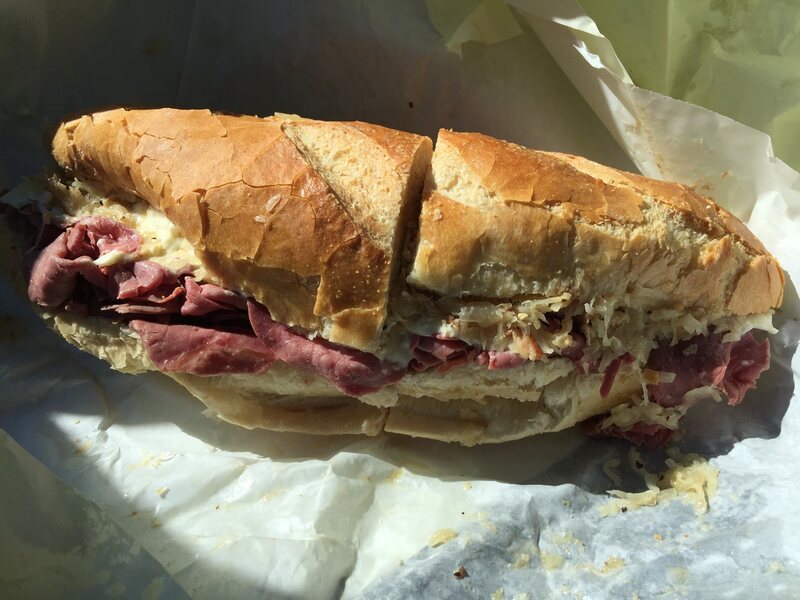 Great-looking sandwiches aside, what's the story behind that Levy's rye bread? I've never seen it before so I'm guessing it's a local/regional brand, but rye is my by-a-mile favorite and I always like to try different varieties when I get the chance. Bring some back the next time you visit home. When I was stationed at Camp Pendleton in 1975 all the roach coaches that came on base sold grinders. There was even a place in San Clemente called the Grinder Stop. I had the day off work and decided to hit Vito's in New Haven. They had been in my head for a while after I saw consistently high ratings online, and I would have gone sooner, but they're closed on weekends. Practically everything in the store - meat, cheese, dressings, pickles, cold salads, everything except the bread - was Boar's Head, with Boar's Head signs prominently displayed. I'll be honest, it made me a tad uncomfortable, and it made Vito's seem like less a sandwich shop and more a Boar's Head outlet. Perhaps that's silly, I thought to myself; after all, Boar's Head wasn't exactly a bad brand, and if the folks here could make good things with it, did it matter? Vito's reputation online seemed unassailable. 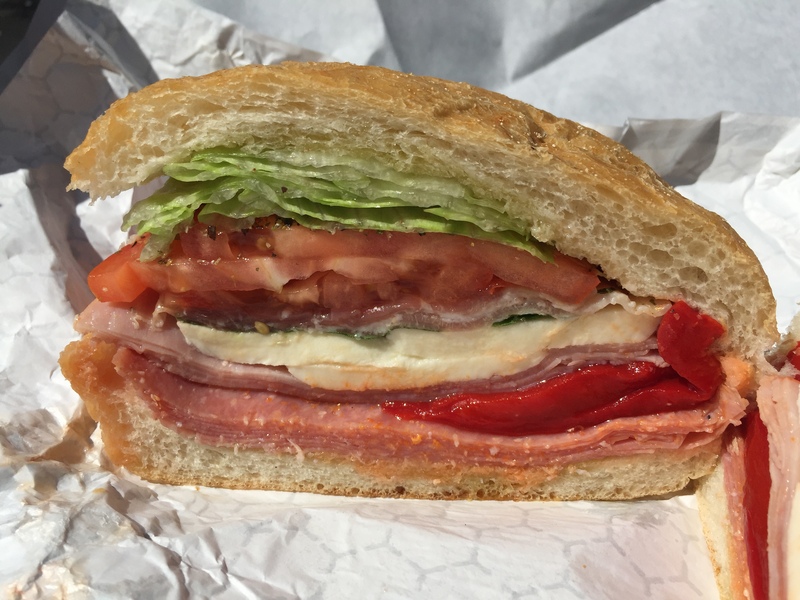 After some dithering, I chose the sandwich named "A Bronx Tale": salami, capicola, prosciutto, fresh mozzarella, roasted red peppers, tomatoes, and olive oil. Hard roll this time, since I wasn't quite hungry enough for a full grinder. The lesson was clear: build your sandwich from scratch. See what's there? Unwanted lettuce, and ham instead of capicola, neither of which I got to see until after I'd already left and unwrapped everything. Sigh. This should have been a lot more special than it was. The cheese, which is part of the sandwich's advertised formula, is my fault: a sharper one such as provolone works much, much better in something like this than mozzarella. 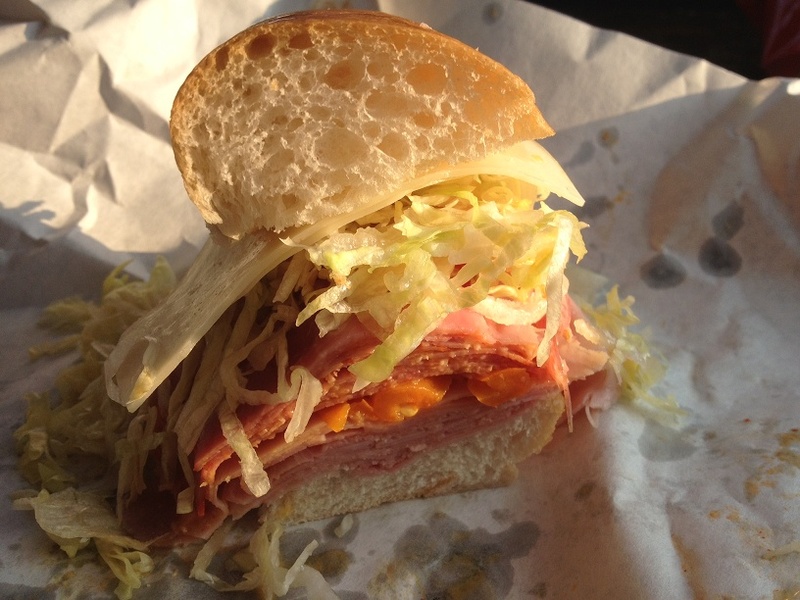 (I guess I didn't mind it on the Cavallo's sandwich because there wasn't as much of it to get in the way.) There was also a harsh bitter taste that I believe was due to a particular leaf of lettuce, possibly the very dark green one that you see above the cheese. 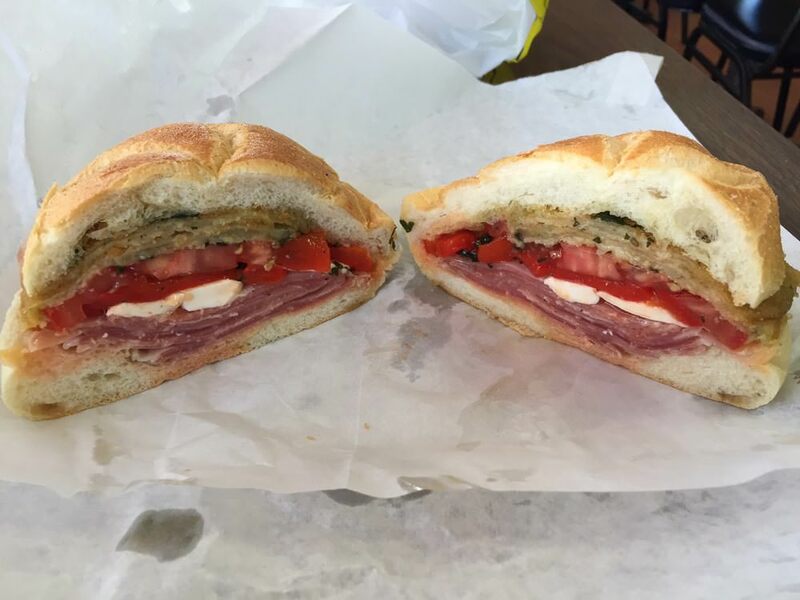 I want to give Vito's another try, but I don't know when I'll have the opportunity, and honestly, when I'm in New Haven, there are other things that I want to eat more than sandwiches. You are so right, skimpy sandwich! 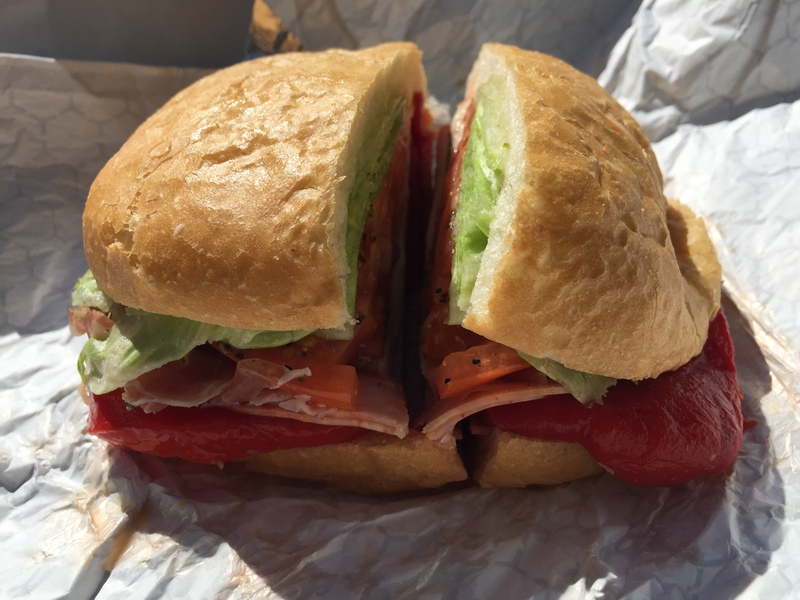 If the sandwich is advertised as containing capicola and you were given ham instead then it's either an honest mistake by the sandwich builder or a ripoff. But I do like the hard roll option. I like mozzarella but since it's so mild it can get lost if the other ingredients are a bit assertive; my choice is always provolone. I agree about the over-hyped Boar's Head . I remember in the 80's they were making a big push on the East Coast, and the product was consistent vs "typical' Grocery store deli items. 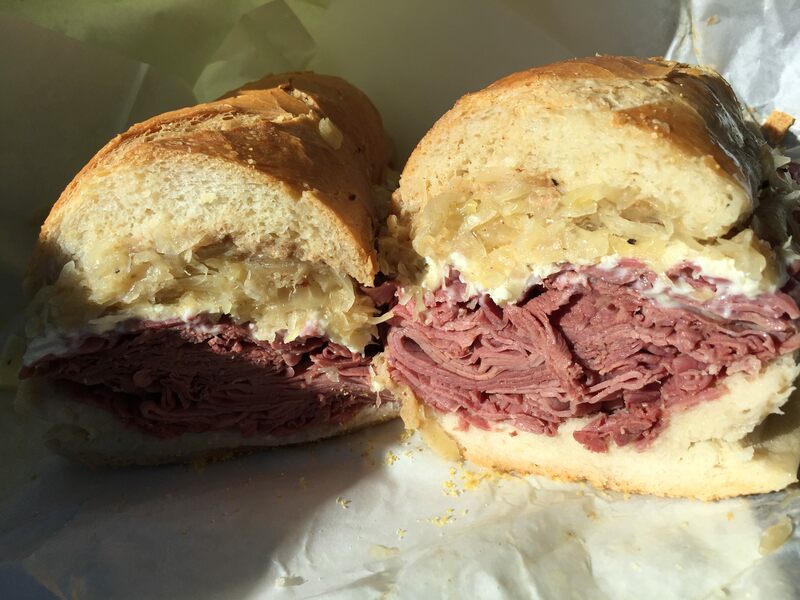 Now, "Delis' (like the NY Deli here in town) states how authentic it is. However Boar's Head offers different lines of products. So, What is their authentic NY pastrami and Corned beef is the crappy items from the big baked Top Round with NO flavor. They don't bother using the 1st cut flats which are available. Any flavored Top Round all tastes the same. MEH! OK, Rant over. They remind me a little of ruthless, aggressive 1990's Microsoft, but other than that I don't have much against them. 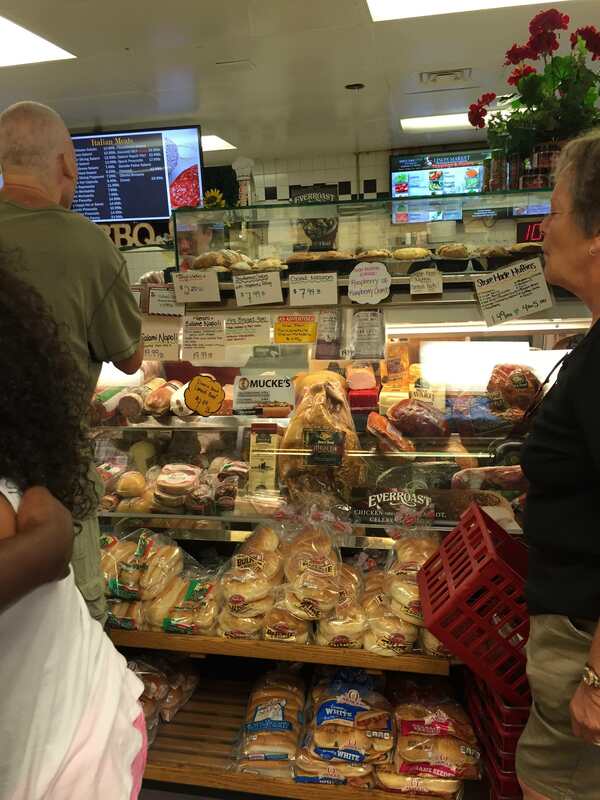 I do see other names at stores, thankfully: Hummel Bros. at Ferraro's Market in New Haven (their pastrami is top-notch! ), Dietz & Watson at Krauzser's stores (and I once saw a Kohler sign at a Krauzser's years ago, but who knows if it was accurate), Grote & Weigel hot dogs at ShopRite and Stop & Shop. I haven't yet found Thumann's deli meats anywhere - only their hot dogs, at the Top Dog stand. 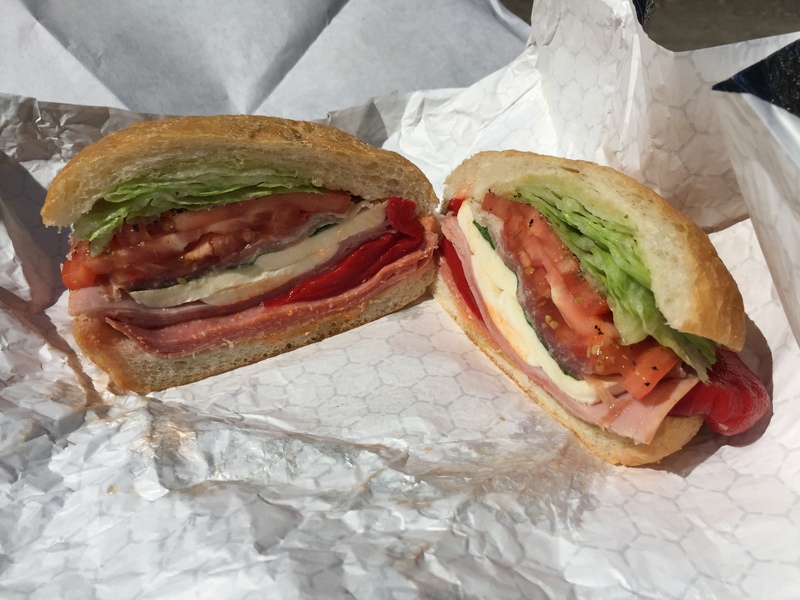 CJ's Pizza and Giant Grinders came recommended to me by a Manchester local. I saw "giant" in the name, and raised my expectations accordingly. Top: CJ's. Bottom: Wethersfield Pizza House. That's not a "giant grinder" - it's just a grinder! They could have made up some points if the cutlet itself had been notable, but it wasn't. No standout flavor in the breading or anywhere else. Sauce was okay. Nothing that let them get away with using the same lifeless bread that one often sees elsewhere. 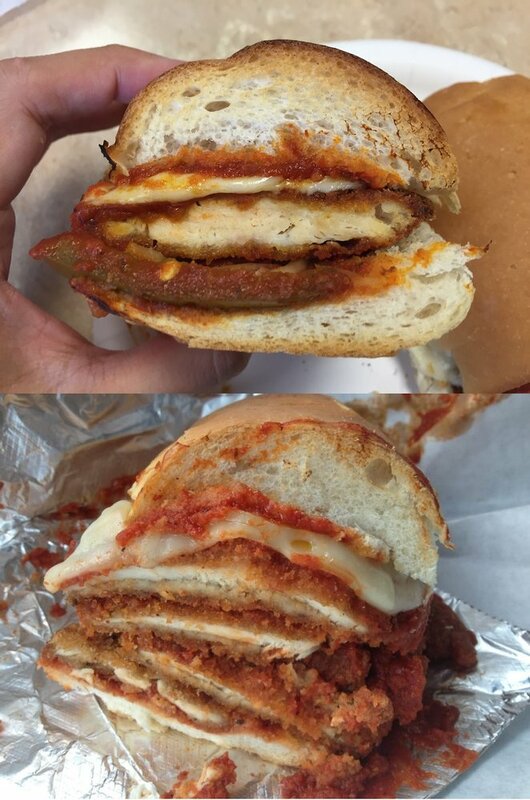 Overall, it didn't seem like anything they took pride in - more like something that was on the menu because, well, grinder shops have to have chicken cutlet on the menu. I think this is probably a case of the local not knowing any better. Or perhaps they have other grinders that are just spectacular. I won't be rushing back to find out. 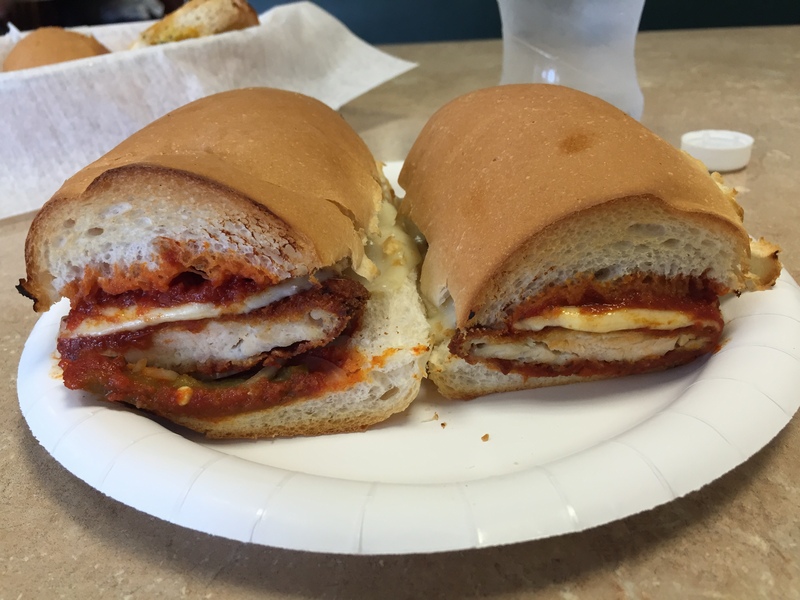 Many pizza joints don't make their own cutlets, and since we often make them at home, this usually is not an item for us at a sub shop. Many use a frozen cutlet, or at best one hanging around for quite a while. Time dictates not making one fresh. 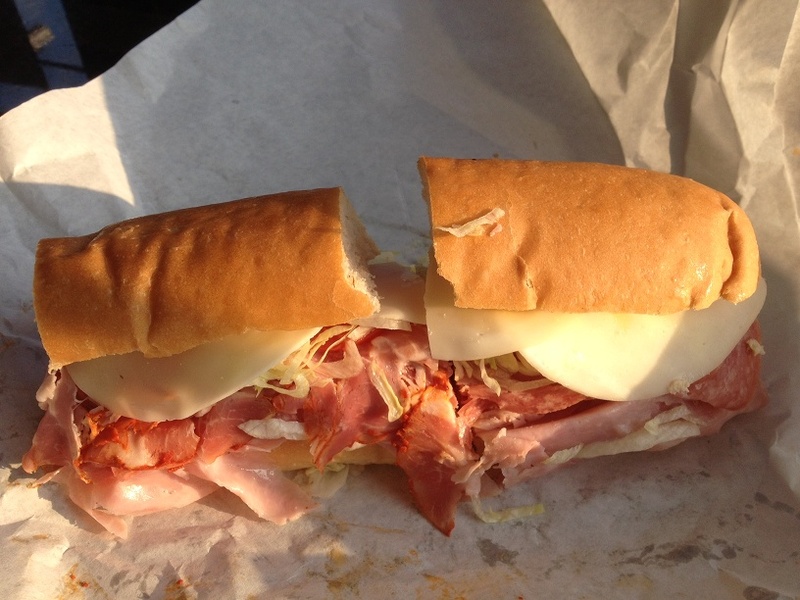 The same for many hot subs, except a Philly steak, but again, you'd be at the mercy of the meat used,(often frozen). 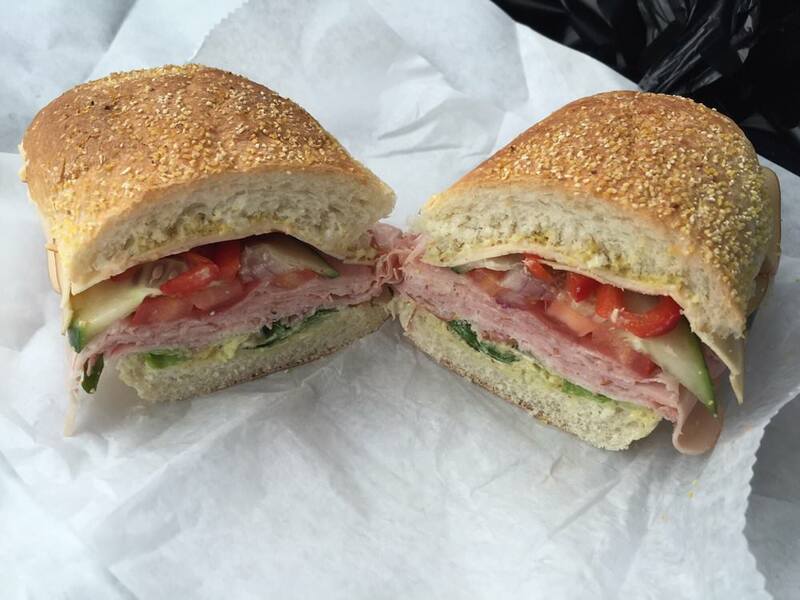 We stick to quality sub places that serve subs on quality Italian bread. , and order a cold sub! We are blessed with many here in Jersey! Oh, I don't doubt for a minute that it wasn't freshly prepared. That I can understand. 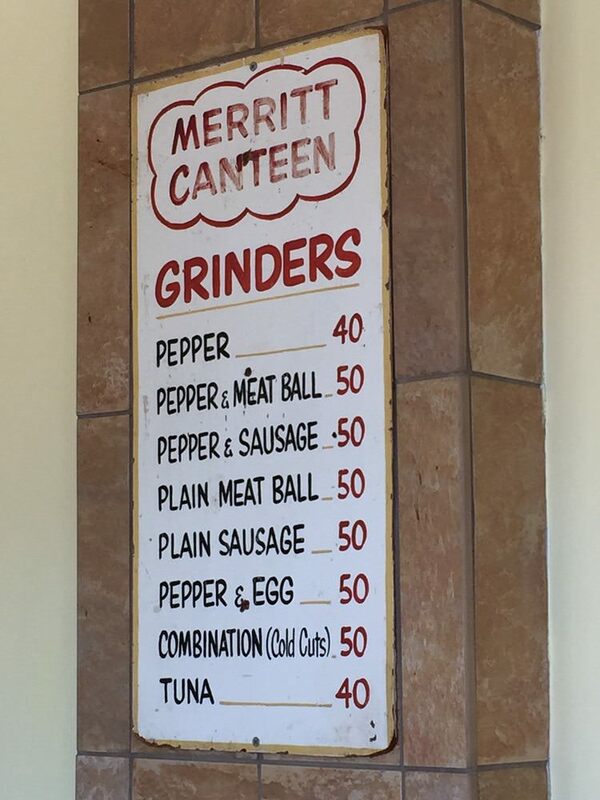 What I don't understand is giving me all of one cutlet in a grinder advertised as "giant"! Well, crap. The Hartford trinity of Franklin, Maple, and Corner is now just the Hartford duo of Franklin and Corner. Maple, which opened in '84, closed a few months ago. The owner stated it was "mostly financial," and I've no doubt that the rest of it is due to the South End's seemingly inexorable deterioration. Good to see that the owner's not just giving up. How does Berlin compare to Hartford's South End? Somewhat sleepy place with a small-town feel. Many small businesses, and a decent selection of eats, too. I hope the economics work out for them if they go there. It's Carbone's Market. It's St. Patrick's Day. You figure it out. Wow....An Irish Sub. Looks great!!! Wow! All the grinders you post look GREAT! the Italian bread reminds me of the French bread I find in New Orleans, Do you know if it does have the same consistency and taste? Having never been to New Orleans, I can't even guess. As you can see, only tuna has survived! 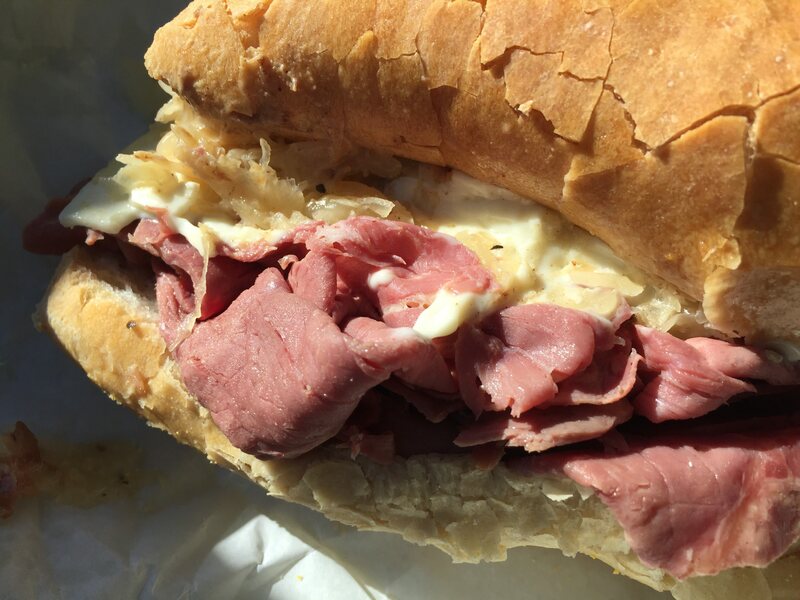 Ketteract, that corned beef grinder looks great! 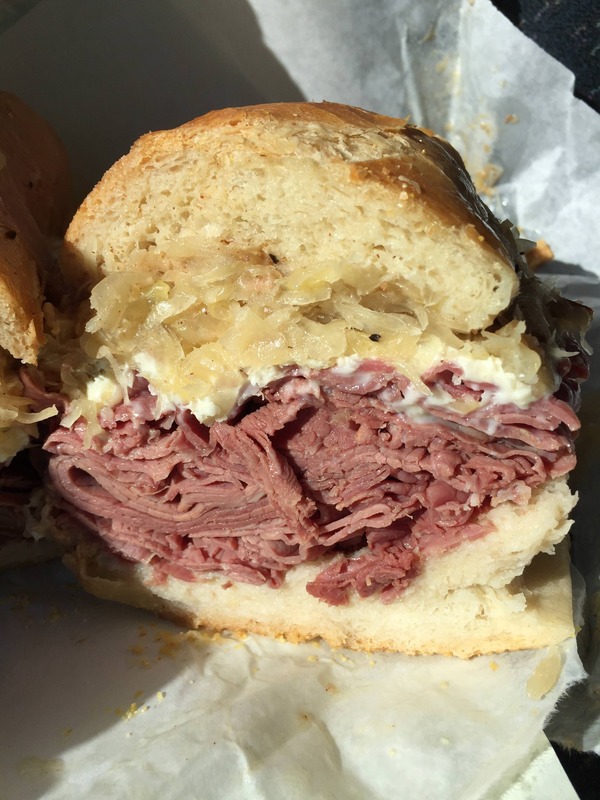 What else is in it beside corned beef and sauerkraut? How was it? Brown mustard and American cheese. It was fantastic. The corned beef was absolutely first-rate, as one would expect from Carbone's, and it'll be another year before I can get ahold of it again! I'm glad to have finally checked it off my list.